This place is nice to gather with friends, have beers and enjoy the fast preparation cuisine. this place is situated in a very frequented area. Burned chips and crap sausages. The service was not bad but not going back there. The old place was much better. 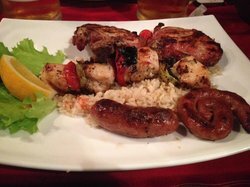 I had the mixed grill and it was the best I've ever had. The service is fantastic and the prices reasonable. Please note that they have moved to a new location. Will definitely go back! Nice place, good location, the right place to have a beer with some food. I recommend to have a table in the part with the trees, favourite dish: pan with sausages, onions and peppers. A place you simply have to visit. Get quick answers from Shakesbeer staff and past visitors.